A lot is heard in the media today about kids with food allergies. Some kids react badly to milk, others to wheat. For some it’s eggs, nuts or fish that cause the problem. The problem is that your child’s immune system regards the particular food – the allergen - as harmful and produces antibodies. These can cause inflammation, itching, vomiting or other symptoms. If your child has been diagnosed by the doctor as having a food allergy, you’ll probably need to rethink your daily meals to cater for him. One of the best ways of helping kids with food allergies is to teach them to cook. By involving them in choosing the recipe, shopping for ingredients and preparing the food, you’ll be heightening their awareness of what they can and can’t eat. And how the most surprising ingredients can turn up where you least expect them! It will give your kids a great start in life and also show them that, just because they have a food allergy, there’s no reason why they can’t enjoy food like anyone else. All pre-packed food sold in the UK must be labelled with the ingredients. The packaging must state clearly if the product contains milk (from cows, sheep, goats and buffalo) or milk products. 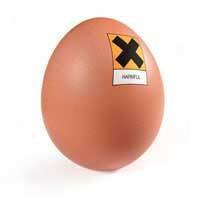 EU regulations also state that a product containing nuts, gluten, eggs, fish, molluscs or crustaceans must make that clear on the label. Some products will have a label on the packaging saying that it’s suitable for sufferers of a particular allergy. Some products will have a ‘May contain’ warning. If your child is allergic to whatever it says it may contain, don’t take a chance: avoid it. Babies who have a milk allergy quite often grow out of it by the time they’re 3 but for a few it will be a lifelong allergy. An allergic reaction to milk is caused by the proteins in the milk. Some children will be allergic to whole milk while others may only be allergic to the casein (the curds) or whey (the watery bit). There are special formula milks available for babies who have a milk allergy. Your doctor or health visitor will be able to give you more information. You should consult your doctor anyway if you are concerned that your child may have a milk allergy. Goats’ milk or soya milk may be substituted for cows’ milk in your child’s diet but they are also both very allergenic. Rice milk is one possible substitute for drinking or using on cereal. It can also be used for cooking. Consider the recipe and decide whether you could use rice milk, water, stock, coconut milk or some other alternative instead. Check the labels on food for milk or milk products. Watch out for lactose, whey protein, milk powder, sodium caseinate and non-fat-milk solids. Lactose, in particular, is used widely in pre-packaged foods and medicines. If milk is omitted from the diet, your child is losing a valuable source of calcium, important for strong bones and good growth. Green vegetables, especially broccoli and kale are excellent sources of calcium. Recent research reported in the Journal of Allergy and Clinical Immunology (July 2005) suggests that if milk is heated to very high temperatures the proteins causing the allergic reaction are almost entirely destroyed and children who had previously shown an allergic reaction could eat them without reacting. More research is necessary but this could mean that milk allergic kids will be able to enjoy a wider range of milk products. Egg allergy is most common in babies under 12 months old. A few will remain allergic throughout life but for most the allergy will have disappeared by the time they reach the age of 6. It’s likely that a child who is allergic to peanuts – which aren’t actually nuts - will be allergic to nuts, such as almonds, walnuts or brazils, as well. The Department of Health recommends that pregnant women should avoid eating peanuts or peanut products if a member of their immediate family has an atopic condition such as eczema, asthma or hay fever. In these cases it’s also wise to refrain from giving your child nuts until the age of 3 at the earliest. Watch out for peanut oil and those products that carry a ‘May contain’ warning as they could be contaminated and it can take just a whiff of peanut to set off a reaction in the most severe cases. A diet without wheat will take a lot of planning. Wheat is an important source of vitamin B and iron for your kids so a replacement source needs to be found. When checking labels, watch out for gluten, wheat starch, bran, vegetable starch or vegetable gum. An allergic reaction to fish is potentially serious so, if your child has an allergy to, for example, cod, you may find that he will have to avoid all fish because of the danger of contamination from one fish to another on a fish counter. As well as fish and the obvious fish sauce, watch out for Worcestershire sauce and Caesar salad dressing, both of which may contain anchovies. A lot of ready-made Oriental sauces also may contain fish in one form or another. With all of these allergens, you need to read labels! And be aware. It may involve a change in your cooking habits but most allergens can be worked around. Consult a dietician (your doctor should be able to put you in contact with one) for advice on planning a nutrient-filled menu.